As your life changes, so do your insurance needs. That's why at BrokerLink, our insurance experts work with you, compare your insurance options, and make sure you get the most appropriate coverage possible. Meaning that no matter how complex your insurance needs get, and no matter where you live in Thunder Bay, you always get the right insurance. We have two convenient locations in town, staffed with friendly insurance brokers who are ready to help you create a customized insurance policy at the best value. We work with multiple insurance providers to make sure you receive several quotes at competitive rates. Contact your local Thunder Bay broker today for all your home insurance, car insurance, business insurance and seasonal insurance needs. 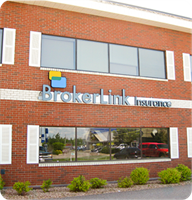 BrokerLink is located on the corner of Balmoral and Alloy Drive (across from Marostica Hyundai).